We are committed to bringing you the very best orthodontic care and this starts with the education and experience of Dr. Gill. He received his Bachelor of Science degree with honors from Northwest Missouri State University in 1977. He then received his Doctor of Dental Surgery degree with honors from the University of Missouri at Kansas City in 1982. Immediately after dental school Dr. Gill joined the Air Force and completed a 1-year general dentistry residency at Travis Air Force Base in California. 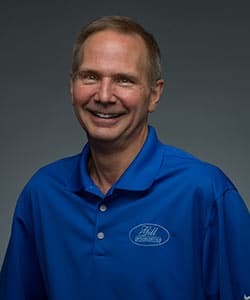 He practiced general dentistry in the air force for 5 years, before returning to orthodontic school at the University of St. Louis, where Dr. Gill received his Master of Science in Dentistry degree with high honors in 1989, specializing in Orthodontics and Dentofacial Orthopedics. Dr. Gill has attained the status of Diplomate, American Board of Orthodontics. The only orthodontic specialty board recognized by the American Dental Association and sponsored by the American Association of Orthodontists. Dr. Gill served in the Air Force for twelve years, including two overseas tours, and a two-year didactic and clinical teaching assignment at the AEGD 2-year general dentistry residency at Keesler Air Force Base in Mississippi. He received an honorable discharge from the Air Force at the rank of Lieutenant Colonel in 1994. After practicing dentistry and orthodontics in the Air Force, Dr. Gill relocated with his family to Evansville, Indiana, where he has been practicing since 1994. He has worked hard to excel in every aspect of his life and he is committed to continuing to do so by bringing you the very best in orthodontic care. Dr. Gill and his wife, Terri, have been married since 1977, and are the proud parents of 3 children: Allison, Matthew, and Andrew. They are very active within their church community, devoting time as Sunday School teachers, teen group leaders, and camp counselors.